The United States National Geodetic Survey lists 28 craters in the state of Arizona. 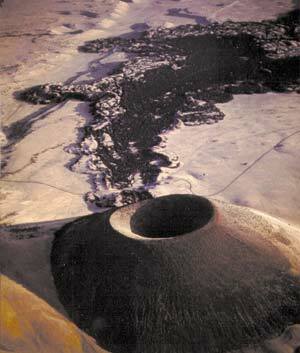 Located just northeast of the town of Clifton, Arizona, this dormant cinder cone volcano and crater is easily visible from the town and In the satellite view of Google Maps. The area is still geologically active, with several hot springs in the area. ^ Ulrich, G.E., Billingsley, G.H., Hereford, Richard, Wolfe, E.W., Nealey, L.D. and Sutton, R.L., 1984, Map showing geology, structure, and uranium deposits of the Flagstaff 1 degrees x 2 degrees quadrangle, Arizona: U.S. Geological Survey, Miscellaneous Investigations Series Map I-1446, scale 1:250000. ^ Finkel, Jori (2007-11-25). "Shh! It's a Secret Kind of Outside Art". The New York Times. Retrieved 2009-08-22. ^ Susan S. Priest; Wendell A. Duffield; Karen Malis-Clark; James W. Hendley II; Peter H. Stauffer (2001-12-21). "The San Francisco Volcanic Field, Arizona: USGS Fact Sheet 017-01". United States Geological Survey. Retrieved 2008-09-02. 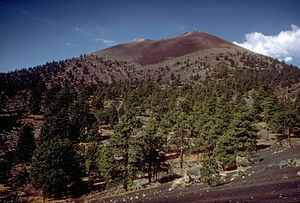 ^ "Sunset Crater Volcano National Monument". National Park Service. 2007-09-14. Retrieved 2008-08-12. ^ Melosh HJ, Collins GS (2005). "Planetary science: Meteor Crater formed by low-velocity impact". Nature. 434 (7030): 157. Bibcode: 2005Natur.434..157M. doi: 10.1038/434157a. PMID 15758988.